How Do You Capture Groundwater Before It Leaks? Collection and ejection. A well-functioning basement drainage system collects water before it leaks onto the floor and transports the water to a sump pump for ejection to the exterior. For basement waterproofing to be effective, it should capture groundwater before it leaks onto the basement floor. Basement Systems' WaterGuard® was designed to solve the issues not addressed in alternative methods of waterproofing and to protect the basement against all possible leaks. Unlike “waterproof” membranes or coatings that allow hydrostatic pressure to build up against the foundation (increasing the chances of high-volume leaks), an interior basement drainage system reduces hydrostatic pressure. It does this by giving ground water an escape route. But controlling groundwater isn't easy. Water can leak into the basement in different ways and at different locations and extremely wet weather can put a great deal of pressure on a basement drainage system. What makes an effective basement drainage system? High-volume, clog-free design. The drain lines should be large enough to handle heavy water flow during wet weather. The drain lines also should be designed to resist clogging that can cause backups. Drainage to capture basement wall leaks. Water that leaks into the basement through foundation walls should be directed to the drain lines before the water can reach the basement floor. Drainage to capture leaks around and beneath the floor. Ground water frequently enters the basement along the joint between basement walls and the basement floor. Drain lines should be located along this juncture to capture floor leakage and relieve hydrostatic pressure. 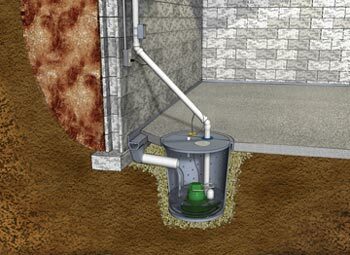 A sump pump system to move basement water outside. The basement drainage system conveys collected water to a sump pit in the basement floor, where a sump pump automatically pumps accumulated water to the exterior. A reliable, high-capacity sump pump like Basement Systems' TripleSafe® sump pump ensures top performance under even the most extreme conditions. WaterGuard designed to outperform other basement drainage systems. Durable, reliable, invisible. WaterGuard® basement drainage lines are made from high-density, non-corroding plastic and are covered with a thin layer of concrete, making the system nearly invisible. The patented WaterGuard® basement drainage system from Basement Systems is the result of our experience in waterproofing thousands of basements. The distinctive profile of WaterGuard reflects its innovative product features. Spacers built into the back of WaterGuard's vertical wall flange allow wall leakage to flow down into the drain line, preventing this leakage from reaching the floor. Perforations along the lower back side of the drain tile capture water that would otherwise leak up along the floor/wall joint. 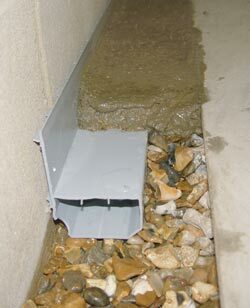 WaterGuard® drain lines are positioned on top of a gravel layer laid down over the wall footing. Specially designed fittings join tile sections together and connect the drainage system to the sump pump.